Here, Information provided, helps us to understand what are Indents and Tabs in Microsoft Word? Anyone who works on Microsoft Word documents has accidentally clicked the hourglass on the ruler at the top of the document and caused the text to move outside its regular margins. The hourglass that causes this frustration isn't a single element, and the indent it applies depends on where you click it. An indent sets the distance between the left and right margins. It's also used in bullets and numbering to ensure that the text lines up properly. Tabs come into play when you press the Tab key on your keyboard. It moves the cursor one-half inch by default, much like a shortcut for multiple spaces. Both indents and tabs are influenced by paragraph marks, which occur when you press Enter. A new paragraph is started each time you press the Enter key. 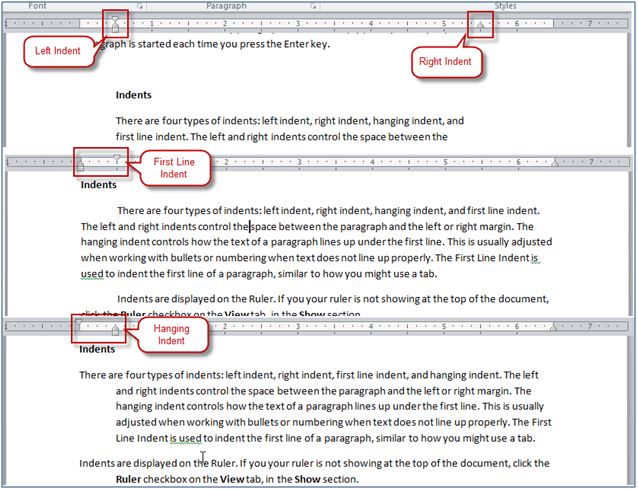 Microsoft Word resets the location of indents and tabs when the program restarts. Indents are displayed on the Ruler. If the Ruler doesn't show at the top of the document, click the Ruler check box on the View tab. The indent marker consists of two triangles and a rectangle. There are four types of Indents: Left Indent, Right Indent, First Line Indent and Hanging Indent. The Left indent controls the space between the paragraph and the left margin. To change it, click on the very bottom of the indent marker-the rectangle-and drag it to a new position. The Right indent controls the space between the paragraph and the right margin and has a marker of its own. It is indicated by a single triangle on the Ruler at the current right margin. Click and drag it to change the margin. The First Line indent is used to indent the first line of a paragraph or of every paragraph. Click the top triangle of the indent marker and move it to where you want the first line indent to be positioned. The Hanging indent controls how the text of a paragraph lines up underneath the first line. This is usually adjusted when you are working with bullets or numbering and the text does not line up properly. Click and drag on the second triangle (the one in the middle) to apply a hanging indent. You can also apply indents through the Paragraph area of the Home tab. What Are Microsoft Word Tabs? Like indents, tabs are placed on the Ruler and control the placement of text. Microsoft Word has five tab styles: Left, Center, Right, Decimal, and Bar. The Left tab is used like the First Line indent; it moves the first line of the paragraph into the tab location. The Middle tab centers the entire paragraph on the tab location on the Ruler. The Right tab aligns the text to the right tab location. If your document contains numbers with decimals, the Decimal tab ensures that the numbers line up on the decimal point. You can use the Bar tab to place a vertical bar on the tab stop position. The quickest way to set tab stops is to click the ruler where you want a tab. Every time you press the Tab key as you type, the text lines up where you put the tabs. You can pull the tabs off the Ruler to remove them. For more precise tab placement, click Format and choose Tabs to open the Tab window. There you can place tabs precisely and select the type of tab you want in the document. How to Record WhatsApp Voice Calls ?